Did many 4 wheel timber wagons run in Ireland? If anybody had links to photos I would be grateful. Below is a link to a googled photo that may have been Irish but I'm not so sure. Any info would be welcome. 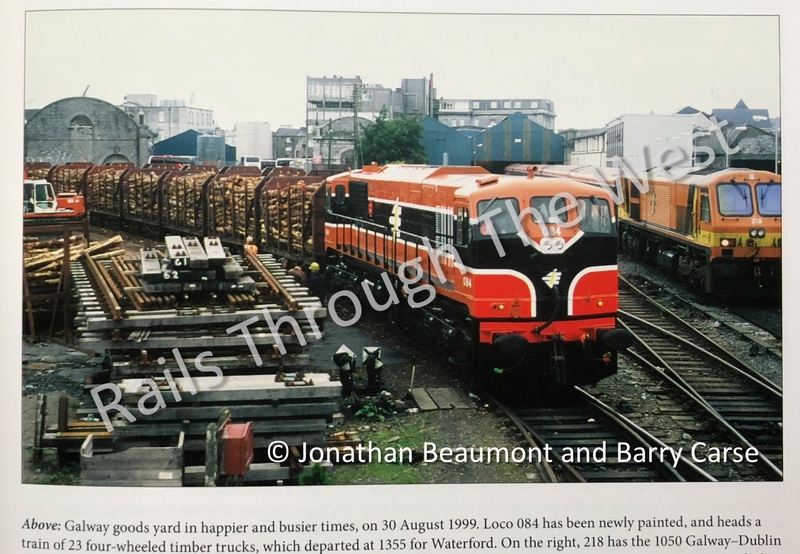 Page 47 of "Rails Through The West" depicts a train of 4 wheel timber wagons departing Galway behind 084 in 1999. They might make an interesting model due to their shorter length, looking more realistic on typical layout radius curves than 62ft bogie wagons. This is a BR OTA wagon. Thank BK. Any idea about the timber wagons on page 47 of JB & BC's book? They seem longer that 20ft but a lot shorter than 62ft. The wagon ends and side stanchions on the Irish wagons were removable and were simply transferred to the 62ft versions. 42 ft bogies flats were also considered. Again ends and sides were compatible with being transferred to the 62ft flats. Thanks as confirmed by Fran, but any idea about the photo on page 47 of 'Rails Through the West'? The photo caption reads ". . . heads a train of 23 four-wheeled timber trucks . . ."
They were long-wheelbase four wheelers. Thanks guys, thats really helpful. Those prototype links posted by @Irishswissernie look great candidates for a model. Any ideas of the origin of the prototypes, length, etc? They almost look like converted 20ft or 22ft container flat wagons??? The DLK log cradles were designed to fit over and straddle the 22'6" flats, the long channel visible in the photo is part of the cradle as opposed to part of the wagon chassis a fairly unusual arrangement. Great footage here of a long rake of 4 wheel timbers. You can see at least one wagon had the white ladder like the 62ft timbers. Thanks for posting Railer. That's brilliant. 24 timber wagons in that clip. Before yesterday I never knew these wagons existed. Short wagons like those would look great on layout curves and snaking over point work. Same as yourself, never knew they existed till I stumble across that on youtube about 4 years ago. Then I tried find out when they were scrapped and the 62fts took over through IRRS journals. It's amazing what happens when you're looking for something, then stumble across some else and go off researching a different tangent than the first topic you had in mind while forgetting all about in the first place. It's amazing what happens when you're looking for something, then stumble across some else and go off researching a different tangent than the first topic you had in mind while forgetting all about in the first place. This was the fab photo from page 47 of 'Rails Though The West' that alerted me to these two axle timber wagons. A long rake of these might look better than fewer long 62ft wagons overhanging typical layout curves. They don't look too difficult to scratch build in plastic, and might fit on top of a Dapol RTR chassis body which costs €7ea inc wheels and couplings. Will investigate same over the next few months. They look fab running in railers youtube clip. Interesting Youtube clip below of 2 axle timber wagons posted earlier above by @Railer. PS: 084 and 218 above are painted in two quite different shades of orange/tan. They look it, yes. The 201s always seemed a slight shade lighter, but I never compared them up close. The difference is probably exaggerated a bit in the photo, as 084 is straight out of the paint pot, while 218 is a bit worn. Yes one has to be careful of optical illusions when checking colours, so with that photo one has to compare the colour on the sides of the loco bodies away from reflection and adjacent strong colours (e.g. red panel on front 084 and yellow on 118). 084 has more red in the mix, 118 has more yellow. Oh for 1960s tan. Would it a good bet that the best ends of the 4 wheel flats were grafted on to the 62 foot chassis - and were these waggons around before and the timber waggons are a recycling project at its best -? http://tencommandmentsmodels.co.uk/product/logs-load-ota-wagon-twin-pack/ , £7 a pop. After a derailment in Ballina in 1999 the wagons were withdrawn from service and a set was stored on the Ballinrobe siding in Claremorris,they were there for about six months before they were worked back to Northwall where they were scrapped. The 62'6" air braked wagons were converted to carry timber traffic. These wagons were used to carry container traffic on the Cork & Galway mail trains and became surplus to requirements for container traffic after mail traffic ceased in 1993-4. There was also a risk of of exceeding the axle load if 3X20' containers with a heavy product such as butter or milk powder were loaded on these wagons. The 4 wheel wagons were a later conversion as timber traffic built up to serve the particle board plants at Bell View & Clonmel. The closure of the Ashai plant in Ballina and failure of Bell Lines in 2007 lead to a substantial drop in container traffic, that would have made most of the 4w flats surplus to requirements for container traffic. Thanks for information very interesting. The reverse of my simple thoughts - but it does still mean that if the shapeways body only print for the 4 wheel is used then it can be grafted on to a 62`6" chassis and more cradles created. I guess an easy way to make the chassis is to cut and shunt the longer chassis from Nile and add a straps box. Unless Nile beats us all too it and makes a wonderful wagon ! Thanks to @BosKonay's 3D link I decided to try a two axle timber wagon. Started on the bench today. I recycled and part cannibalised an old Triang chassis I had since childhood. If I like the look of it when I'm finished might try scratch building a few more bodies using this as a measurement template. DIY NEM 362 pockets fitted so I can use Kadee or TLCs in the future. That came out great Noel. I made a half dozen a few years back and it’s a nice quick job! Thanks Stephen. Yes it only took about 45mins to get to that stage, mostly filing and sanding all the crude seams off the old Tri-ang chassis, and then build up the NEM pockets. I tried all the gearbox Kadee's I had, but I didn't have 142 (medium overset) which might have screwed nicely on to the chassis without any spacers needed, so I went the NEM route and plugged in a no 18, and changed the plastic white rimmed wheels for metal ones. What donor chassis did you use for yours? I neat job and mirrors real life ! Is it a metal underframe - it would a good mass to the wagon given the 3D print weighs very little. In real life was the donor chassis from the same family of wagons that gave wheels to the double beets ? In real life was the donor chassis from the same family of wagons that gave wheels to the double beets ? I thought the beets were 12' wheelbase Mk.1 flats and the timbers were 14' wheelbase Mk.2 flats, but someone could well correct me. Hi Good to know thanks. As you explore the wagon history of CIE it proves to be very interesting and makes modelling just that bit more fun, so thanks for all the information. Who knew there was so much in timber carriers ! Work continues on a sample two axle timber wagon. Painted and weathered, just decals, vacuum pipes and white tips left to do. Happy with the way the kadee worked out on the ancient 1972 Tri-ang wagon chassis - now thats recycling. May try and copy this body with a few pasticard repeats. 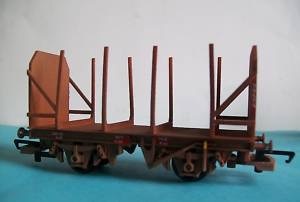 I've loads more old Tri-ang wagons for chassis donors. Super Noel. I used the old Dapol chassis on mine. A pair - snap. Very nice! Now I might have to invite you over for a play day and we can run a timber train. Was just realising what a great resource the folks on this forum are. I never new such a wagon existed until I re-read @jhb171achill's book, posted a question on this thread only last week, got fab information, a magical machine in a foreign land printed a plastic body shell, a parcel flew by air to Ireland, a postman delivered it in a little green van, I did a little kit bashing and painting, and 8 days later I'm running a model of the wagon in question. Thanks again chaps.